The Sephra Classic chocolate fondue fountain is small enough to take with you to any gathering, but large enough to make a big impression! It is an unforgettable centerpiece at weddings, engagement parties, baby showers, dinner parties, birthday celebrations, children's parties, holiday parties, anniversary parties, business gatherings, grand openings... and many more. 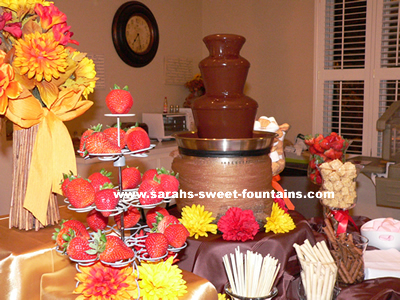 This elegant chocolate fountain package includes everything you need to ensure your event is a "sweet" success!! Feed up to 200 guests! ANSWER: Yes, this item is available for shipment to Canada for $100.00 (not including taxes, duty or import fees). Please contact us toll-free at 1-877-313-0200 ext 1 to place your order.